Since 1975, it has been illegal in the United States for a company or individual to own a newspaper and a radio or television station in the same local media market. The point of this rule was to prevent powerful private entities from enjoying overwhelming influence over how Americans saw the world. In 2017, six corporations own 90 percent of American media — and the Republican-led Federal Communications Commission has decided that concerns about media consolidation have become obsolete. Michael Copps, a former FCC commissioner and current adviser to the good government group Common Cause, begged to differ. The move may not be in the public’s interest, but it almost certainly is in Donald Trump’s. 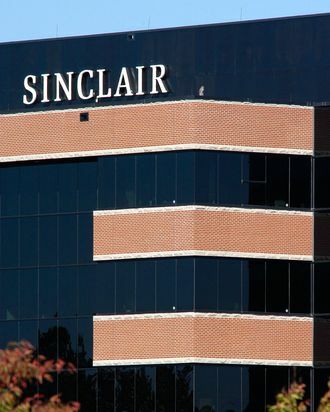 Sinclair Broadcast Group, a media giant owned by a pro-Trump GOP donor, is on the cusp of purchasing Tribune Media — and thereby, claiming ownership of enough local television stations to reach 70 percent of American households. Sinclair requires its affiliate stations to air right-wing commentary, including regular segments featuring Trump’s former spokesperson Boris Epshteyn. When Trump first took office, Sinclair’s merger with Tribune would have been impossible — FCC rules limited how many local stations a single entity could own. But the commission relaxed those rules last spring. With today’s decision, the FCC cleared another obstacle from the merger’s path: Purchasing Tribune media will give Sinclair ownership of both a newspaper and TV station in ten American markets.